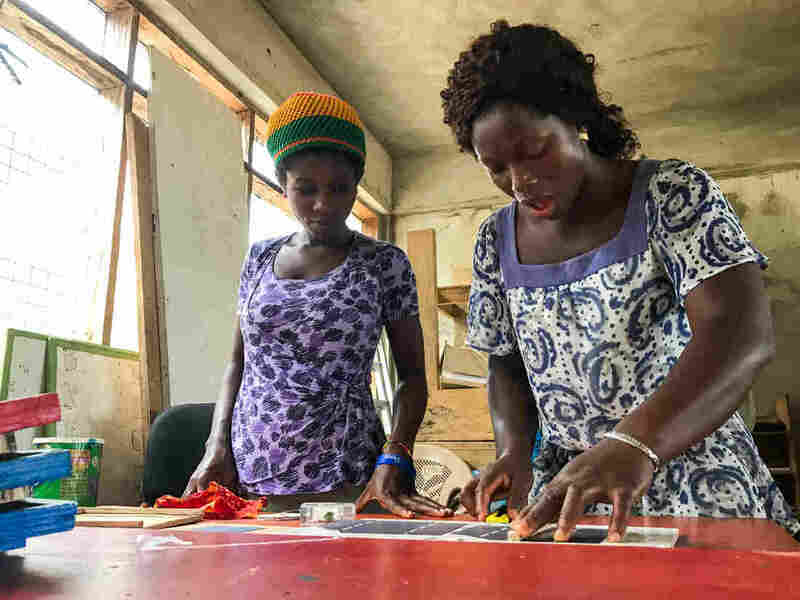 Women In Ghana Learn How To Be Electrical Engineers And Solar Power Specialists : Goats and Soda A school is teaching them to be electrical engineers — and to defy local stereotypes that engineering is a man's job. Judith Ausah (left) and Evelyn Sewodey create solar panels at the Lady Volta Vocational Center for Electricity and Solar Power in Ghana. "At first, I thought it was man's work," says Ausah, whose 2-month-old daughter stays in the school nursery. "But I came here and saw that, yes, women can do it." 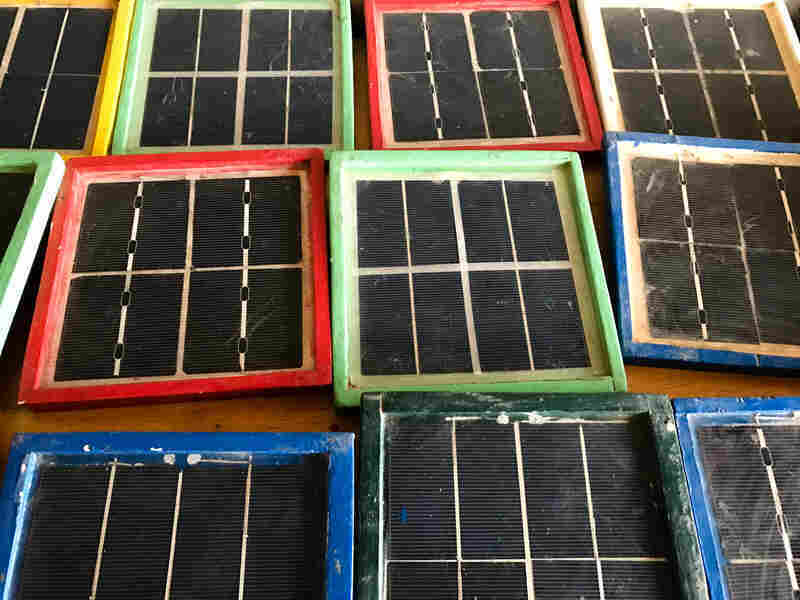 Solar panels made by students at the vocational center. Evelyn Sewodey, 25, used to sell fried yams in her village of Tanyigbe, a job that really wasn't going anywhere. Two years ago she heard about a new free program that taught electrical and solar energy skills to disadvantaged young women (and a few men as well). She didn't really think she'd be interested in electrical engineering. Nonetheless, she went to an open house at the Lady Volta Vocational Center for Electricity and Solar Power in Ho, around 7 miles from her home. Sewodey took — and passed — the entrance exam, answering questions to determine a student's motivation, social skills and math knowledge. Sample questions run from "What are your dreams?" to "What's the volume of a cube that's 1 meter long, 1 meter wide and 3 meters high?" And so she began the two-year program, with classes in math, English and, of course, electrical engineering. She's now waiting for the results of her final exam and then will begin looking for a job. And Sewody has changed her mindset. Not only is she interested in electrical engineering but adds that in her community, "to see a woman doing a job that is traditionally for men is empowering." It's definitely empowered her 3-year-old daughter, who imitates mom by pretending to screw in light bulbs at home. "The school's philosophy is that what men can do, woman can also do," says George Ofori, regional coordinator for Ghana's National Youth Authority. He goes into rural communities to recruit potential students. "Lots of women have nothing to do in terms of jobs and so seeing that these women have made lots of achievements in this program, communities now encourage the women in their villages to participate." The program began in January 2015, co-run by the nonprofit groups Village Exchange Ghana (VEG) and Social Venture Africa. The initial idea came from two economists Christoph Bertsch of Germany and Cristiana Benedetti Fasil of Italy. Volunteering for VEG back in 2012, they worked on a project offering small loans to villagers. "We had the opportunity to go to rural areas to talk with women, and everyone had a cell phone but often there was no electricity," says Brussels-based Benedetti Fasil. "There were lots of power cuts, so people had to come to Ho to charge their phones. They had to pay for transport to town and then pay to charge their phones. So we were thinking how to address this problem." Since 2015 nearly two dozen students have enrolled. In March, the school will launch a new 3-month training program as well, partnering with the multinational company Schneider Electric. The graduates won't be as skilled as the two-year grads but the goal is to get more people trained in solar engineering. The Schneider Electric Foundation's Access to Electricity program is donating a number of benches — tables with models of electrical installations used in both residential and industrial settings. Five of the benches feature solar equipment — for example, a model of a solar water pump. Around mid-April, the students will tackle an ambitious project: building a midsize solar grid for the school's three buildings in Ho. The grid will power an LED light system and computers and also serve as a backup for other equipment, including sewing machines used in the batik classes. "It is a chance for us to learn whether the prototype we want to develop works well and could be marketable in the future," says school co-founder Bertsch. "I think the idea is very good," says Fernando Vega-Redondo, a professor of economics at Italy's Bocconi University. He's familiar with the Lady Volta program from time spent in Ho researching how social networks can aid entrepreneurship. "It is operating on a relatively small scale," he says, "but it would be great if they could expand because it has a lot of potential and is fulfilling a need." And the students aren't just learning about electricity. Last year Eveyn Sewodey interned with a local electricity company, climbing up and fixing utility poles. One evening her husband could not reach her. Upset, he called the school to say she would not be coming in the next day. According to Benedetti Fasil, when the school called the next day to check in with Sewodey, her husband said in a huff that she had in fact gone back to work. "He told them, 'Ever since she came to school she has become assertive,'" says Benedetti Fasil with a laugh.